One such night went like this. I had been craving Korean BBQ. I know, strange for being in Japan, but I LOVE Korean food. Maybe even more than Japanese food truth be told. We explored a few different towers of culinary cuisine and finally decided upon one restaurant with a beautiful view of Akihabara below. 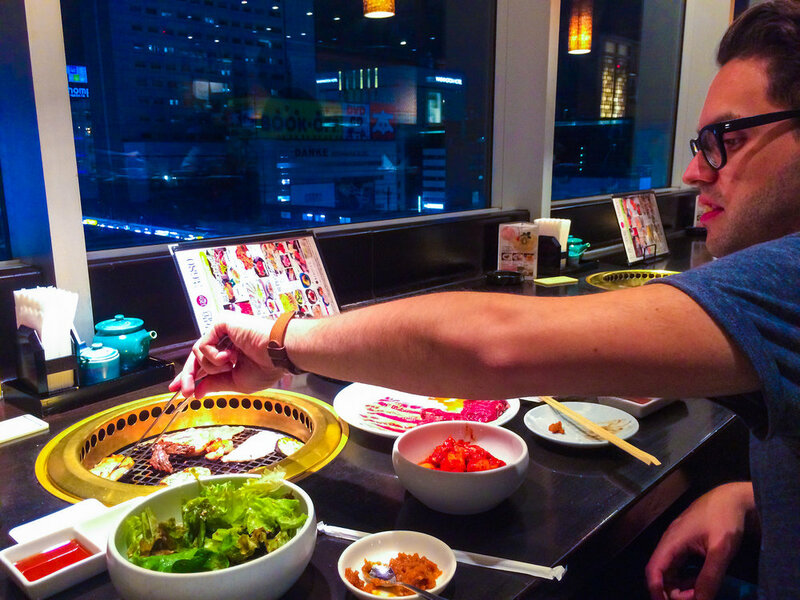 Unfortunately, the only way to eat much of Korean BBQ was "all you can eat". And I can't eat a lot. I'm not a tiny person, but my stomach just can't eat a whole lot at one sitting. And at this particular place the price wasn't too cheap and only after you finished the first course of regular quality meat could you ask for the good stuff. We didn't' seem to bother. The average quality was incredible, but when we said we were full and didn't need to order anymore, the poor waiter seemed so distraught like he felt he was ripping us off. But we knew the deal and didn't mind. We got out to fill and had a great piece of live entertainment (with the view) while we eat. Plus, it was the best Korean BBQ I've ever had with the best kimchi I'd eaten to boot. 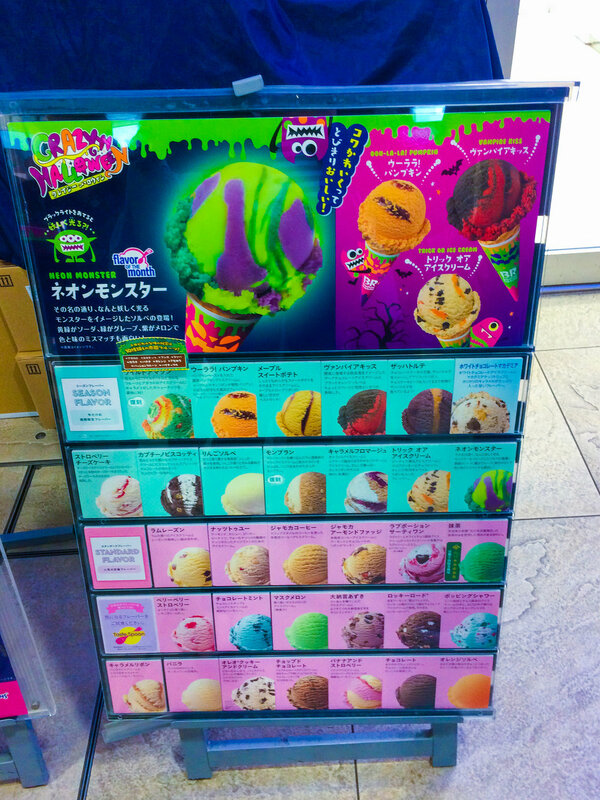 I decided on a Tombstone Sunday, with three flavours of their Halloween ice cream. 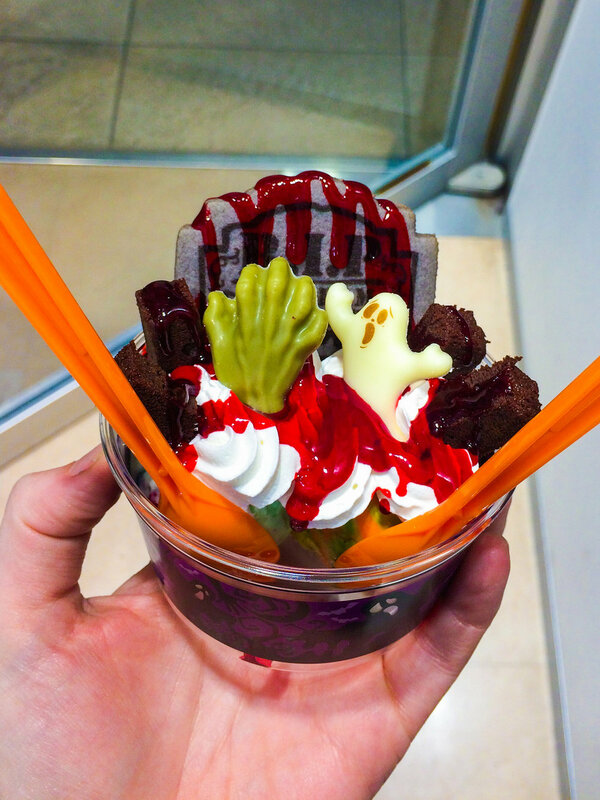 The entire dessert looked like a graveyard, covered in blood with hands (made of cookies) popping out of the "dirt". After filling up on sweets, we'd head back out into the night to explore the evening arcades. Our favourite thing in the arcades were the UFO catchers. Although we never managed to win anything, the sheer drama of playing and watching others win was a very good time. Plus they always had such strange items to win, like the bloody bear arm stuffed animals....kind of weird. Even though every arcade was very similar, different brands had their own look and feel which made them stand apart, and you quickly would find which one you liked the best. Another late night activity - for those of us not too interesting in drinking the night away - was shopping at Don Quijote. The one in Akihabara is open 24 hours a day, and with over six floors of goods, there is always something new to discover. My favourite part of the store was the cosmetics section. Japanese and Korean cosmetics are some of the best in the world, and Don Quixote carried hundreds of brands and products I'd never even seen before. The unique were the character themed cosmetic, even featuring my nostalgic favourite - Sailor Moon. Don Quixote also always had a hilarious selection of animated character pillows and cushions. The best way to end a night out in Tokyo is to go to a karaoke room. These companies run their business out of towers, some as big shopping malls, where you can come in any time of the day with any size of group (or even just solo) and book yourself some time to sing your heart out. Once inside you select what kind of room you'd like, how long you wanted to sing for and even what kind of karaoke system you want to use. We had no idea what the difference was, but I'm sure to the experts they are night and day. Some karaoke shops even offer costumes along with your hourly rental if you want to amp up your enjoyment. Once assigned a room, you headed to the right floor and took it over. Even the doubles rooms were huge with plenty of room to spread out. They were very private and aside from smelling like cigarettes (not all are smoke-free) are so cute! You had coat hooks, phone chargers, mirrors and some even had music instruments like tambourines and cowbells! I was pretty shy about singing, but Dan wasn't shy at all and belted his favourite songs out. It got me in the mood for singing, and soon enough we had Phantom of the Opera and New World blasting down the halls. Once inside your private booth, you have access to their full menu which often featured some delectable meals. I helped myself to a few Sundays, always their house specialties, and never regretted it.